If you know my family history, I am sure that the thought of ME taking a course to become a Registered Tax Professional is downright comical….. borderline hysterical. Yet, when this product came up for review, I was INTRIGUIED! My husband and I had just decided to start a business, and with our finances the way that they are right now, I figured that maybe if I complete this course, it could be an avenue to bring in a bit more income from home. So I said yes, and started back to school….. Tax School. This distance education program is offered by National Tax Training School It is an institution that has been around since 1952. They offer a variety of courses, The Federal Tax Course, The higher Federal Tax Course, The California Preparers Test, and courses for continuing education. Reviewers were given the choice on which class we wanted to work from. I chose the Federal Tax Course because it would teach me more about personal Federal Income Taxes as well as Small Business taxes. I won’t lie, I was nervous when the big box arrived with my name on it. I took a deep breath, got to work. The lessons move topic by topic through all you need to know to properly fill out Federal Income Tax Forms. If forms are discussed in the lessons, copies are included for you to look over. Many scenarios are given to try to simulate some of the real life situations that you may come across when people need their taxes prepared. I would read the lesson, sometimes twice and then read through it a third time taking the self test as I went. I would write notes to myself on the self test explaining what I may have gotten wrong. Sometimes it felt like the scenarios they gave were weird, and convoluted….. but over time as I worked through them, reading them to myself out loud; then re-reading the material, I got the gist of what I was supposed to be looking for and the questions became easier to answer. Here are a few topics that the Federal Income Tax course covers. After taking the self test, you move to the graded test. This test you take, and send off to the teacher for grading. (GULP) I was a nervous wreck waiting for them to be mailed back…. I felt like I was waiting for my finals grades in college! When they arrived, I was pleased to see I didn’t tank…. So far all A’s and B’s. (I may get the hang of this back to school stuff after all.) The instructors sometime write helpful comments on your tests to let you know where you may have missed the question. The company normally sends you the second half of the course when you complete Lesson 17. However, for the purpose of this review, they sent it early. Now I have TWO ginormous binders to work through, and much to my surprise I am looking forward to finishing it all. 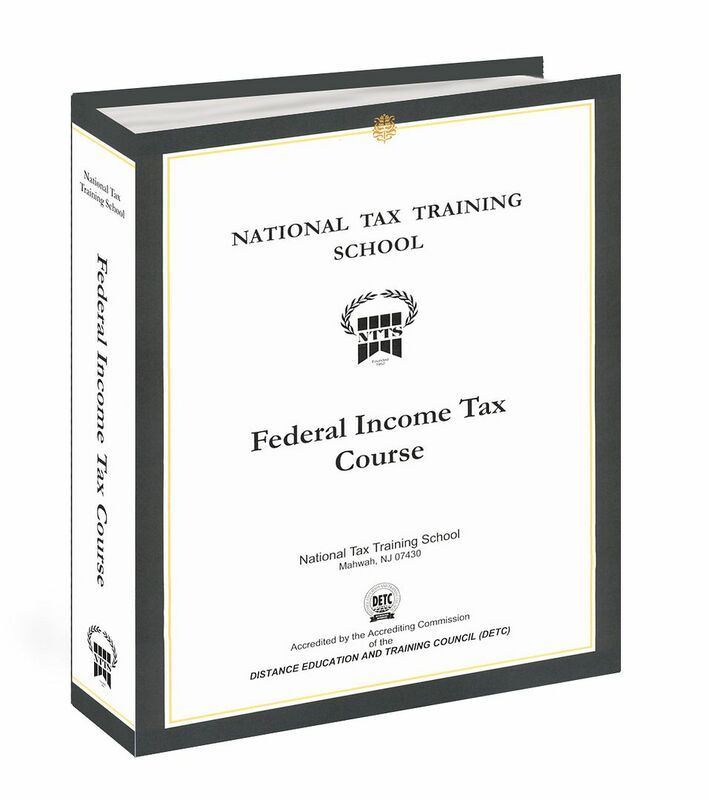 National Tax Training School has also created a way for their course to be completed online. The benefit would be instant grading feedback, and the ability to have discussion on the course. The online structure, that I have seen, is easy to use. Though, I think I prefer having the actual pages to flip through to help me find the answers. I might have a panic attack if my Internet froze in the middle of a test. The course is available at several different enrollment options, Each with varying degrees of post graduate support. Yes, that’s right; they work with you after you have completed the course to keep you up to date on the current tax codes. You can begin your tax training education with a starting payment of $159.00, and scheduled payments to follow, or you may pay in full. The complete program with 4 years of post grad support is $795, the full course with 2 years of post graduate support is $495. If you are looking for a distance course for yourself, to help your family income, I recommend this course. Don’t kid yourself, it is work! You will feel confused at times, but keep reading and stick with it, and you will have success. If I can get A’s and B’s, anyone can! Maybe you are looking for an at home trade school option for your high school student or graduated high schooler. I think that this is a great course for those that want to earn an income before college or maybe instead of college. At the completion of the course a person should be ready to take the IRS Registered Tax Preparers Exam. Passing that test would be the key to earning money as a tax preparer. To read what others had to say about their experience with this product, please click on the button below. I was given access to the Federal Income Tax Course by National Tax Training School free of charge for the purpose of this review. No other compensation has been received. This entry was posted in High School, TOS Crew Review by julie. Bookmark the permalink. Wow! Did you post your great grades on the fridge?? What business did your husband start? Is it the custom-made chess sets or something else? Wow! You did something with NUMBERS in it for no compensation?? You are a far better person than i am!